Last week's selling actually points to more upside. No doubt about it, last week's price action was jarring for most investors. Volatility flooded into all the major indices starting last Wednesday, resulting in a nearly 5% selloff in the S&P 500 by the start of this week - and a 56% two-day spike in the (VIX.X Volatility Index. And despite the rebound rally that the broad market pulled off Tuesday, many investors are understandably feeling gun-shy in the face of all the added volatility. The good news is that last week's selling actually looks like a pretty textbook move for the S&P 500 - and, from a technical standpoint, it's one that sets the stage for new highs in the months ahead. To decipher what's happening in the big picture, we're turning to the charts for a technical look. At a glance, it's not hard to see the over-arching trend in the broad market right now. 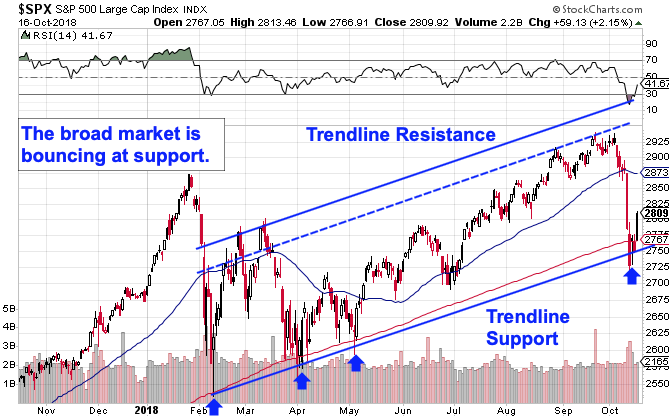 Despite the sudden selling that stocks experienced last week, the move actually looks pretty consistent with the uptrend that's defined most of the price action in 2018. From a technical analysis standpoint, the market was in "make or break mode". Well, it looks like stocks decided to make it by catching a bid at trendline support. 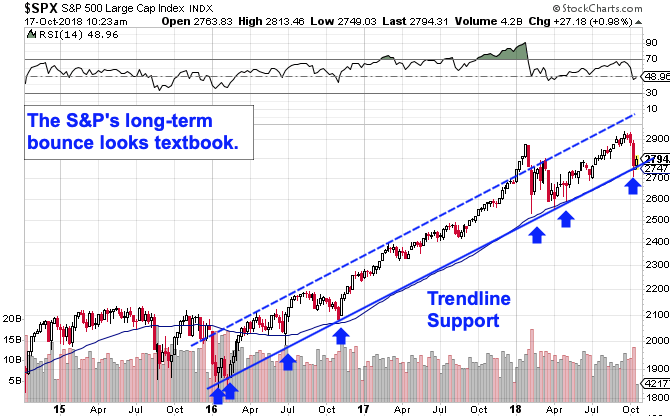 Stretching back to the bottom of February's correction, buying at trendline support (even when the S&P temporarily dipped below that trendline) has been a high-probability trade. And that makes this fourth test of trendline support look like a good opportunity to add to portfolios this fall. The chart above shows weekly price action in the S&P 500 since the end of 2014. This long-term chart makes the make-or-break nature of the S&P's trendline test a little more clear - and, likewise, it makes the bounce we're seeing here even more meaningful. Every test of this trendline stretching back to the very start of 2016 has been a stellar buying opportunity. Likewise, the early bounce we're seeing in the broad market this week looks consistent with prior reversals off of support. That's no guarantee of what happens next, of course - but it does lay out what's more likely than not to happen from here. We're still in a "buy the dips market" this fall. This week's buying pressure is the signal that it makes sense to add to positions.